How Many Calories Do You Burn If You Jump Rope 600 Times? Jumping rope is an effective calorie-burning exercise, which in turn means that it is a quality exercise choice for those interested in losing body fat. Consistent jump rope workouts and a healthy eating plan will likely lead to weight loss. The number of calories you burn from jumping rope 600 times depends on different factors, and you may have to adjust the time you jump to burn enough calories to lose weight. Burning a significant number of calories during your jump rope workout is important because it makes a direct impact on your weight-loss goals or your ability to maintain your current healthy body composition. If you’re interested in losing body fat, you need to burn more calories than you consume over a set period of time. There are 3,500 calories in a pound. The number of calories you burn by jumping rope 600 times depends on the speed at which you complete the jumps and your current body weight. Heavier people burn more calories during the same intensity workout because they must exert more energy to complete the movements. The speed of your jump rate also has an impact. Jumping rope burns a significant number of calories. A 160-pound person burns about 730 calories in 60 minutes of jumping rope. A 200-pound person burns about 910 calories and a 240-pound person burns approximately 1,090 calories. Jumping 600 times will not take 60 minutes. According to What’s Cooking America, if you jump at a rate of 70 times per minute, you can estimate the number of calories you burn per minute by multiplying your body weight by .074. If you do 125 jumps per minute, multiply your body weight by .080 to estimate the calories you burn in a minute. If you are faster on your feet and do 145 jumps per minute, estimate the number of calories you burn per minute by multiplying your weight by .089. You can then multiply that value by the number of minutes it takes you to complete 600 jumps. To successfully lose weight, the American Council on Exercise recommends trying to burn about 500 calories per day with exercise. To lose a pound of body fat, you must burn 3,500 more calories than you consume. If you were to burn 500 calories with jumping rope and eat an appropriate number of calories every day, you would lose about a pound of fat per week. Completing 600 jumps in your workout will not equate to 500 calories burned, so use the number of calories you burn per minute of jumping rope and adjust your workout time accordingly. 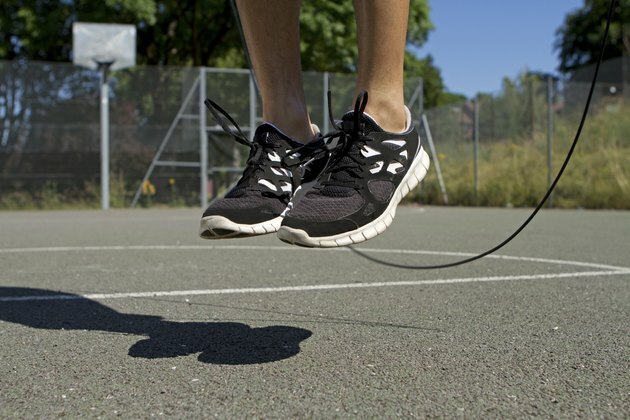 If you weigh 200 pounds and jump rope at a rate of 70 jumps per minute, you will burn about 14.8 calories per minute. You would need to jump about 34 minutes to burn 500 calories.